October is my favorite month of the year...mayyyybe it's because my birthday is coming up but something about autumn just makes me happy. Pumpkins, hoodies, fresh apples, warm pies? Mmmmm, I'm sold. And of course candy corn! Julep was sweet enough to include some in this months October box. I stuck with my bombshell box because I was very intrigued by Cleopatra, a black latex polish. 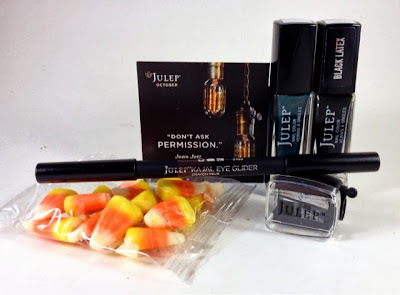 Also included was Valerie, a double sided kajal eye liner, an eyeliner sharpener and some candy corn! Those little saccharine sweet pumpkin candies are my favorites in the fall, candy corn is the next best thing since it's made of the same stuff! 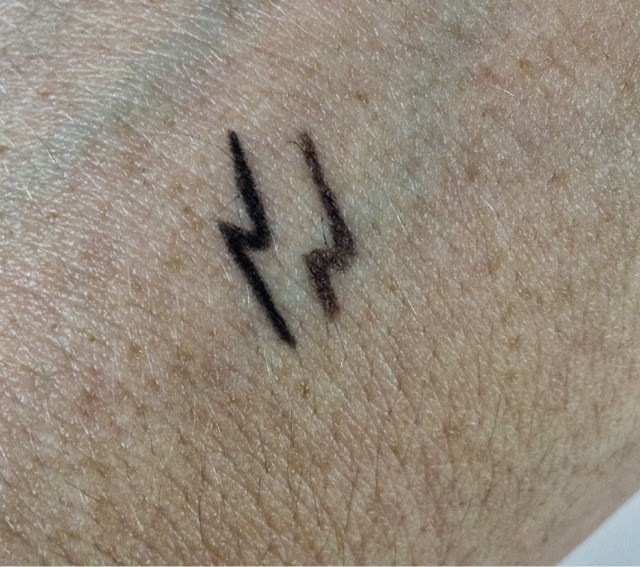 I'm always up for eyeliner. It is one of my daily items for my makeup routine. I tend to lean more towards brown for daytime looks and I vamp it up with black for going out. I have a million sharpeners but this Julep one is a nice treat for those that may not have one. Getting everything you need is always a plus! 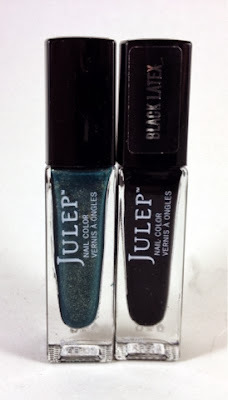 I was very impressed with Juleps Kajal Eye Glider liner. It was so easy to control! One swipe left a lot of pigment and it didn't move to smudge easily. My go to eyeliner is typically Urban Decays 24/7 in zero but I'll be swapping it out for the Kajal for awhile to try it out more. So far no disappointment here! My bombshell colors this month are Valerie, a teal irridescent microglitter and Cleopatra, a black latex creme. Valerie is a deep teal. The microshimmer is a beautiful gold with some iridescence to it. This polish was a little bit thick and pungent to me. I've occasionally had Juleps like this before. It was still usable and looks great on the nail. The microshimmer is very glittery when the light catches it but stays a quieter teal in most lighting. This is a great office color! Cleopatra is a really fun and Halloweeny shade. This black dries matte for a latex finish. Insta bad girl. This only thing I didn't totally love about this shade was how much the polish clings to imperfections. My middle nail had a terrible break so I patched it up with a teabag. With the base coat sanded down most polish over the patch looks fine but with Cleopatra, because of the finish, every and wrinkle shows through. (My middle finger is also patched above with Valerie but it is barely noticeable) If you have ridges on your nails definitely use a ridge filler base before using Celopatra. This look with some studs is all I can think of wearing for Halloween!